There's no relationship with God and man that's true and real and sustainable if it isn't built upon a Revelation of Jesus. We must be "born, not of natural descent, nor of human decision or a husband's will, but born of God." Anything less then this, and the gates of Hell will continue to prevail in churches, families, and relationships. A person who is walking in a Revelation, a Consciousness of God, a fullness before God - that person will discern, and "know," and Stand against the evil one, love others deeply from the heart, and lay down their lives for the Lamb. No one else will have what it takes: His Life and Presence. “Revelation of Christ”...Jesus said that this is the rock on which everything else must be built. Only those that are daily about the Father’s Business amongst the People of God, walking in the midst as family, can apply these things. Let’s say that we see someone’s life in such a state that they are religious, committed perhaps on the one side, but never seeming to quite “get it.” It seems always like they are wandering from concept to idea to movement to belief. Convictions are superficial. There’s a ring of truth to things they may say—the words are right, but somehow there is a sense that there’s not a fullness there. It’s not who they are, it is just what they say. They are just ricocheting off ideas. Today they do the “right things” but tomorrow they may say or do something totally “off the wall” spiritually. Why the inconsistencies? Why the “durrrrr”? Because they have not had a revelation of Christ. Borrowed words, even in sincerity, are different from a revelation that has come from the Father, rather than from man. Consider another person that is just living in a worldly sort of state, wandering from entertainment things, to intellectual musing, to family idolatry, to this, to that, to the other. They can easily be seduced by the love of money or relaxation or worldly literature or art or a sunset. They seem to have energy for all sorts of things that they don’t have purely for Jesus. Such do not have a “single eye” or “live for Him Who died for them” or “live and move and have their being” in Him. Rather, Jesus seems to be an extra thing in their list of important things—perhaps even at the top of their list, but not their “all in all.” Their affections are spent other places, but they’re good people and they basically believe in God. How can this be? They are not living in a revelation of Christ. The gates of hell are therefore prevailing in their lives. Satan’s domain has overrun the ground that rightfully belongs to Jesus. Usually it can be traced back, as Jesus said, to the fact that they have not had a revelation of Christ (except one that flesh and blood has revealed to them). Someone that has truly stood face to face with God in their heart and their spirit, will find it very hard, very nearly impossible, to turn back from that Revelation of Him in their life. Someone that has truly stood face to face with God in their heart and their spirit, will find it very hard, very nearly impossible, to turn back from that Revelation of Him in their life. They may suffer setbacks; they will fail in certain areas of their life; different things can creep in and dilute Life at times. There may be certain times of wavering. But if you look over a long span of time, you’ll find them always progressing. Somewhere in their heart and in their life they are growing and they are even learning from their failures. Someone who was an alcoholic told me that alcoholism progresses even when one has quit drinking. This man cited examples of friends of his who seemed to prove the “experts” correct. If his alcoholic friends went back to drinking, even ten years after they had quit, the problem was as bad as if they had continued drinking for the full ten years. The same is true on the opposite side. The antithesis, the spiritual reality, is this: if a person has *really* seen God and met Him, they may flounder for a period of their life, but there’s still a progression in their life. They even learn from their own foolishness. They learn from their disconnectedness. They’re in touch, even with the fact that it’s a rank, terrible, pitiful and a pitiable life apart from God. They become more and more convicted of the necessity of abiding in Christ even when they are not. They will even amaze us in how they stand up for God and share Jesus with others, while they are doing terribly themselves! Out of their own agony and rebellion, they still know God is the only answer. You see their relationship with God progresses in a sense, though their external fruit is bad. (If one would intentionally “crucify Jesus afresh,” thinking that they’ll recover from it someday anyway, they are not true Believers. I am not speaking of one that is smug about God’s “grace,” but one who would say, as Paul, “What I do—I HATE!”) Even those that are functioning poorly are still growing—if they’ve had a revelation of Christ. If a person hasn’t really found God, they’ve only found a form of godliness. If they’ve found a religion about God, but they’ve not really met the person of God, then the above is not going to be true. They are going to be bounced off ideas, and their failures are going to sling them backwards. They will always try to make this patchwork quilt of a so-called christian life work, putting great effort into it all with only marginal results. Basically, that’s the story of christendom for the last two thousand years. There’s been a lot of patchwork stuff that’s not really based on a true relationship with God. Most has been, unfortunately, a belief system that’s to be adhered to, a guilty conscience searching for relief, an alternative career path for the ambitious, or other sorts of things. There’s no relationship with God and man that’s true and real and sustainable if it isn’t built upon a revelation of Jesus. The reality is this: Jesus said that there is no church that’s real if it isn’t built first and foremost on a revelation of the Christ of God. There’s no relationship with God and man that’s true and real and sustainable if it isn’t built upon a revelation of Jesus. It cannot be anything that a man can inject into another with words or Bible studies or prayer meetings or anything else. It’s something that we must each find with God Himself. We must be born, “not of natural descent, nor of human decision or a husband’s will, but born of God.” Anything less and the gates of Hell will prevail. A rare man or woman will have tremendous impact on planet earth in a very short amount of time. I’ll use a man in the 1800’s as an example, but there are others. This particular man went out into the woods and said, “I’m not coming back until I find God.” Now the reason why this man affected a half a million people in a few years is that he took it all very seriously. That was his attitude. He went out into the woods...and started crying out to God. At one point he got this sense that somebody might be there in the woods watching him and overhear him. He got embarrassed that someone might think that he was making a fool of himself, and stopped crying out to God. Then something inside him said “No! I am not backing down! Who cares if a mere mortal of flesh and blood, 98% carbon and water, overhears me talking to the immortal God? That’s his problem, not mine.” Then he raised his voice to God again, shamelessly. What I’m saying is: *you* know if you’ve really met God or if you’re just striving with things about God and concepts and distant sorts of things *for* Him. *You* know if you have made your true home in the Father, Son, and the Holy Ghost. *You* know if the Spirit truly testifies with your spirit “Abba!” Has the Spirit of God shed abroad His love into your heart in a way that is unexplainable—or, is it just something that you see as an idea and a goal? Is it simply a concept, or a current experience—so real that we didn’t even need to read about in the Scriptures (since we, too, share the experience of which Paul wrote)? Is it real, or do we simply strive to put the pieces in the right place and do the good Christian life thing? No one would want to say of you in absolute terms that you haven’t had a revelation of God, even if there is considerable distressing evidence by the way that you live. Yet, *we* can know whether we’ve personally met God or if we are just participating in religious exercises. No matter how scriptural or well-intended we may be, we *know* whether we’ve found God Himself, or just things about God. The antidote for not having met Him starts with honesty—“blessed are the poor in spirit.” We have got to start with an acknowledgement before God like that man in the woods did. We know nothing and are nothing. Read Romans chapters one through three and consider that God is talking to YOU. Then you will be ready for the Power of Romans six and eight. The man we referred to earlier that went on to change over half of a million lives was a leader of a church. And, according to the religious world’s standard, he had all kinds of good things going for him. He was an attorney with great intellect, he knew the scriptures backwards and forwards, but was honest enough to say, “I don’t know God.” He was painfully honest to the people around him, too. He’d go to prayer meetings at this church he was a part of, for example. He’d stand up at the end and say, “You guys are wasting your breath. You are praying prayers to the air. I’ve been here a long time and I’m not seeing these prayers being answered. You guys are only kidding yourselves.” He was just that honest with other people and with himself. The man wouldn’t play the game. He had to have reality, or he wanted nothing. There must be a recognition and declaration of our empty souls apart from a living God. That’s the attitude we must have to find God, the true God. We begin where the “Beatitudes” begin: “poor in spirit.” There must be a recognition and declaration of our empty souls apart from a living God. Without pride, without defense, without any need to justify ourselves, or a need to point fingers, or compare ourselves to other people, or point to the good things we’ve done or the things that we know. We’re just on our face before God. That has got to be the starting place—poverty of spirit and recognition of our need for the true God. It is such a temptation to pump ourselves up with things about God. There is a “famine” in the land—that’s the diagnosis. What is this famine? Simply this: we are not living in true Revelation. “Where there is no revelation, the people cast off restraint.” Let me say it again, yet another way. Too many have not yet had an unveiling of Jesus of Nazareth to the eyes of their hearts that is unshakable, tangible, Life-giving and *real*. The true thing can’t be taken away from us, it can’t be beaten out of us, it can’t be reasoned out of us. Failure won’t diminish it (Joseph in prison), success won’t erode it (David on the throne). We can’t be shaken because it’s as real as our own existence—and more trustworthy than that by far. We know that. It’s an inner sense of the Son of God that came to set captives free and to remove the sins of His people. Rock solid revelation to the heart that didn’t come from flesh and blood (something we simply heard from another mortal human being and decided for or against). Apathy, I should hasten to add, if Revelation is missing in your life, will KILL you. “Well, I don’t know if I have that or not. That just sounds like words.” If it sounds like words, that’s pretty much proof that you don’t have true revelation that the Father has bestowed upon you. The two men on the road to Emmaus said, “Did not our hearts burn within us as we walked along the way?” If you have a true revelation of Christ in the inner man, you can surely identify even with my feeble descriptive words about revelation of the Son of God. You’ll be able, no doubt, to add your own words, “Not only that but this too!” You will feel that vibrating, resonant frequency in your inner man: “Did not our hearts burn within us as we walked along the way? !” That is one mark of true Revelation. This is not meant to be an insult, but to drive all to want Him and Reality in a desperate way! Honesty with your true condition, “poor in spirit,” is always the starting place. God is looking diligently and forcefully to and fro throughout the whole earth to find someone that He could fill with His Spirit. That kind of attitude is what God has always worked with. And that’s why so few people have truly been filled with the Spirit (other than the stuff that characterizes much of the charismatic world today). Filled with the Spirit of Christ—the Living God, rising up out of a man’s character to shine forth like the stars in the universe: that’s filled with the Spirit. Other things are accessories to that, but there is so little of the real thing today. So few are willing to start with the humility of saying, “I’ve been ‘preaching’ for 20 years, I’ve been a Christian for 30 years, I’ve been an elder, etc., but I don’t know anything. I’ve not experienced Christ, I’ve just known about Him.” That is the starting place—a deep, deep, deep hunger for the real thing, and an honesty to admit we don’t have it if we don’t. A personal Revelation is the only thing the Church is built on—everything else is sand. So, how do you get somebody from point A to point B? Talk to them about these very things; whet their appetite for Reality. Call on them to pursue. God is looking diligently and forcefully to and fro throughout the whole earth to find someone that He could fill with His Spirit. He searches for ones that He could allow the Spirit of His beloved Son to work through in an untainted, unhindered way. He finds so few that will stand in the gap, so few that will ever pay the price to be treated as His Son was—with a reputation as a scoundrel. He finds few willing to embrace the cost of the Cross—so He can’t invest His Spirit in them. These Truths are those that I would beg someone to consider if I saw them caught between the two worlds of life and death. These are the things I would beg one to consider if it was obvious they are in serious need of a true Revelation of Christ that flesh and blood has not revealed, but the Father Himself has revealed. Having been given this understanding then, one might still decide to approach the need for a revelation of Jesus with apathy. Possibly the obstacle to pursuing this vigorously is pride, or the personal price they would pay—reputation, salary, whatever it would cost them to pursue a revelation of Christ. If this would be their approach to the precious Word of Life regarding the need for Revelation from Heaven (rather than head knowledge or the traditions of men), there is trouble. A personal Revelation is the only thing the Church is built on—everything else is sand. Therefore, if a person lacking in Life in Christ will not “like a newborn babe, crave pure spiritual milk,” we have little ability to continue or even begin any Walk with them. If we try to build on anything less than their own personal Revelation of the Christ of God, we are basically investing in a house that will collapse. The house that will stand is one built solely of Living Stones that have a revelation of the Son of God. These *desire* to “put into practice” His words (Mat. 7) because they see Him as King and *experience* Him as King. Others may believe His words externally, but seldom put them into practice because they do not “see Him who is invisible.” That house is built on sand. We must not participate in the building of a house that’s built on anything less than a true revelation of Jesus. If a church or fellowship is built on anything less than every single person having a revelation of Christ...there will be serious trouble ahead. Unfortunately, “a little leaven leavens the whole batch.” If a church or fellowship is built on anything less than every single person having a revelation of Christ (or desperate to have one and not apathetic about it) there will be serious trouble ahead. There mustn’t be an open fellowship and open receptivity to relationship based on something less than an encounter with God that each have had personally. And YES, this does most definitely apply to even physical family relationships! We have a new family and a new Father, if we have been born a second time. If a person is desperate to have a Revelation, or is currently walking in a revelation of Jesus—it’ll be clear even by the supernatural quality of your conversation with them. OF COURSE we can reach out to those that do not emanate Jesus because they do not walk with Him face to face. This is considerably different, however, from open fellowship. We can ONLY fellowship with Jesus, and the measure to which one “lives and moves and has their being in Him” is the extent to which we can give our heart away to them in fellowship. I can’t tell you the heartache and the time that’s been lost when I’ve thought I could build any other way. To build on any of those things I mentioned earlier—personalities, styles of worship, creeds, friendships, convenience, etc...building any other way causes an infinite number of problems as well as heartache to God. If a person is desperate to have a Revelation, or is currently walking in a revelation of Jesus—it’ll be clear even by the supernatural quality of your conversation with them. They surprise you! You are not hearing just clichés and superficial nonsense. Let me use prayer as an example. To fall into a pattern of conversation with God that’s predictable in its tone and content is an illustration of a nonexistent current revelation of God. If I have a real relationship with you, I’m not going to say the same thing in a monotone every time I see you. I can’t. So, if God is real—a revelation—it is the same. I wouldn’t say to my earthly father, “Father this, father that, father, father, father ___”—so how could I ever be so empty with my Father in Heaven? That is, if He is real to me. If God *is* real to me and I have an ongoing dialogue, then even my “prayer” (such an unnecessarily religious word) is going to have a certain vitality to it that is surprising to an outside observer. There is a quality of conversation that’s unique to relating to a person rather than to a concept. “’Intercession’ is what it’s all about” would then be a thought or statement of one who doesn’t know God, but rather a concept. “Intercession” doesn’t mean a thing, really. Stay with me now! Jesus loves us and wants us to speak with Him and His Father about our mutual concerns—*that’s* what it’s all about. Him. The first is religion that is man-centered. The second can only be experienced by revelation that comes from the Father. I know this is a subtle distinction, but try to understand. I’m not meaning to offend anyone, but I do think it is time for God’s People to get past religion (in the man-centered sense) and find Jesus. So many are desperately needy for Him, rather than things “about” Him! If we’ll abide in Him and follow His lead, we can trust HIM that we will witness many Sons coming to Glory. There must be revelation of Him as a person to our hearts. These things are not mysterious. They are obvious. If a person is desperate to have a revelation of Jesus, or if they are currently walking in one, we can build together. If they are not, then it matters not at all how nice they are, how little trouble they cause, how sacrificial they are, or how spiritual their vocabulary, how much fun they are, or how long you’ve known them. They can give their body to be burned and give all their possessions to the poor, but there is no way to fake the real thing. If the qualities of God that can’t be sustained or attained just through human effort are not overflowing, there is nothing. This is the meaning of Jesus in John 15 when he said those dramatic words, “I am the vine; you are the branches. If a man remains in me and I in him, he will bear much fruit; apart from me you can do nothing. . . . If anyone does not remain in me, he is like a branch that is thrown away and withers; such branches are picked up, thrown into the fire and burned. . . . This is to my Father’s glory, that you bear much fruit, showing yourselves to be my disciples.” And again, “He said to the man who took care of the vineyard, ‘For three years now I’ve been coming to look for fruit on this fig tree and haven’t found any. Cut it down! Why should it use up the soil?’ ‘Sir,’ the man replied, ‘leave it alone for one more year, and I’ll dig around it and fertilize it. If it bears fruit next year, fine! If not, then cut it down. May we then feel free to continue indefinitely to pour resources into those that demonstrably do not abide in Him and bear His Fruit? Do we have freedom to decide who may “use up the soil” that He has intended to multiply His Life? Are we more “merciful” and “patient” than God that we might ignore the Teaching of Jesus? Of course we must see things as Jesus does, and know that He loves more than we could ever love. These things, difficult as they may seem, are for His Glory! He knows what is within a man, and sees the beginning from the end. If we’ll abide in Him and follow His lead, we can trust HIM that we will witness many Sons coming to Glory. We will participate in the church that HE is building—a church that the Gates of hell can no longer prevail against. We are doing NO ONE a favor by building a “strange fire” and overlooking Jesus’ teaching. He doesn’t need us to do Him any favors by increasing numbers for Him on Sunday mornings! (The Stone the *builders* rejected has become the chief cornerstone. This is hardest for those that have pride invested, or an income at stake. The *builders* are those that will feel the piercing of God’s Way to build most profoundly.) I know this all requires much prayer. God’s House “is built with Wisdom.” Please, please, please...for Jesus’ sake, take all of this into your closet of prayer. We have it on the authority of Jesus of Nazareth that the house will be destroyed if it isn’t built purely, solely, and fundamentally on this one issue: everyone having a revelation themselves of the essence of Jesus—that flesh and blood did not reveal. Consider again, if there is not that internal *surprising* quality of God inside of a man that can only be had by a revelation of Jesus, if there is not an observable fruitful Jesus-Life, they *cannot* be abiding in Him. The gates of Hell will eventually prevail. If I behold Him I *will* be transformed into His likeness from one degree of glory to another. If I’m not seeing Life in a person, then I can’t possibly have open fellowship with them, and they cannot be in the midst of the body of Believers in any full way. I can only fellowship in the measure that Jesus is manifested from their inner man! If they don’t have open fellowship with God, then I am not free to offer open fellowship to them—it doesn’t make sense. It has to be true Life, or it is just religion. This couldn’t be more fundamental to your ability to relate to each other in the church, and how you address problems when they come up. There is no more fundamental or important question than this: “What does it mean that the church can only be built on a revelation of Christ that has come directly from the Father?” That is the only house that Jesus is going to build, and the only one that the gates of hell cannot ransack. Why build a house if you know it’s just kindling for a fire that is going to come along next month? Why would you do that? Why would you build a house if you knew it was on the San Andreas Fault and there is going to be an earthquake next month? No fool would build a house knowing full well it is going to be destroyed in the near future. We have it on the authority of Jesus of Nazareth that the house will be destroyed if it isn’t built purely, solely, and fundamentally on this one issue: everyone having a revelation themselves of the essence of Jesus—that flesh and blood did not reveal. Nobody talked them into it. Rather, they themselves saw God. The Father Himself interacted with them as they themselves could acknowledge under a lie detector test. They have a relationship with the Father. No human just bestowed concepts upon them that they have embraced as their own, and that is all they have. No! It is something real. If it is anything other than this true Revelation, then the house is going to fall apart and the gates of hell will prevail. The “church” we are a part of, built upon any other standard of day to day Life, will be of very little account to the undoing of the Enemy. It will be filled with leaven that leavens the WHOLE batch, and the Testimony will be filled with mixture, and impotent. There will be “cracks” that too many “little ones” simply fall through, because the programs were insufficient for the war with the enemy. That is why this issue (the acceptable basis for “membership” of a church and any open fellowship is ONLY true revelation of Jesus in the inner man by each individual) is so basic and fundamental and important to our futures together. Why do you think it is that Jesus said this Revelation would be the Foundation that He would build His church upon, and yet all of this is almost unheard of, or acted upon? Surely satan himself does violently oppose the ONLY thing that hell cannot prevail against—a Standard of *each person* having a revelation of the Life of Jesus. A placebo, the junk food of “a nice social environment,” “great preaching,” “lively, inspiring worship,” “sound doctrine,” etc. (as good as those things, *properly defined*, are) will only be a laughing matter to satan. Hell will prevail within such churches improperly built on the sand of the wrong foundation. Failed or miserable marriages, rebellious children, troubled and sin-afflicted teens, worldliness among the adults . . . these things and many more will mark the attempts of any “church” or “fellowship” to build on any other basis. Every man, woman and child “associated” with the Body of Jesus *must* be living in a personal revelation of the Christ of God, or desperately seeking one at any cost. As we’ve said, we can reach out to others—those that are not living with Jesus in the unseen world, but we may not give our hearts away to them in yoking friendships or fellowship. Nor may we count them a part of the local assembly of Believers. **Question: How do we help each other? I know that this revelation is not something we have just one time. I know it is something we have initially, and then cultivate on an ongoing basis. How do we help each other to keep the blinders away and stay fresh in Him? Well, part of it is, as you suggested, keeping the blinders away: helping each other pull the weeds. Our inability to see God is often the product of bad seed that we have sown. To simply pull weeds leaves the field empty and subject to the next bunch of weeds. If Christianity or our relationships to one another is simply pulling weeds in each others lives, all we end up with is an endless chore, with limited results. It could be characterized in unkind terms as false religion. Pulling weeds is not the only thing required in helping each other to know Him in a real way. Although, if a person is living with certain vices in their life, certain attitudes, certain priority systems, certain ways they spend their time and affections, these things will most definitely rob them of their future. They need to be made aware of that. This is part of the role we play with each other. For sure, “Admonish one another daily so that none are hardened by the deceitfulness of sin as long as it is called today.” You’ll need to keep doing this everyday. Make sure that you are helping each other to uproot these things that would block a revelation, but understand it in those terms. These are things that block revelation, these are not wrong things that you better stop doing. These are things that block revelation. If we lose sight of what it is we’re doing in helping pull these weeds, we’re going to lead them down a path of religion rather than to a revelation of Jesus. They’ll never have anything; it will always be unsustainable. They will always need crutches—people around to help them pull weeds constantly. And it’s an endless chore. If you’ve ever tried to keep weeds out of a plot of ground when there’s nothing growing there, you’ll know what I mean. It is a full-time job. It’s not possible. Some might mistakenly put an emphasis on simply pulling weeds. Weed pulling is essential, it’s mandatory, but it’s only with the issue in view of bringing about ultimate Revelation. We must often be careful how we word our discussions with others about the “weeds” in their lives. Point one another vertically! “Do you realize you need a Father in your life, and you can’t have that if you continue to live in this? !” That’s so different than saying, “You better quit that. It’s sin, so stop it.” So different. One is pulling weeds and the other is removing obstacles so that they can see Jesus. You’ve clearly identified it as something vertical because you’ve pointed them towards Jesus. “Here’s what you could have if you weren’t indulging in this other junk (which won’t satisfy you anyway.) You could have ‘Abba’ as your protector and as your guide and as your teacher and as the lover of your soul. You could have a relationship with the creator of the galaxies as a friend, just as Abraham did, if you weren’t indulging your flesh in this junk. There’s only so much room in your heart, Jesus said. If you fill up your heart with junk, you have no room for him. Those were His words. So quit filling up your heart with junk; I’m begging you to make room for Jesus!” In doing that, we’re preparing them for Revelation rather than stopping them from doing a sin. The thing we are trying to help impart to one another is to make sure they know what they could have as a relationship with the Father, Son and the Holy Ghost. The thing we are trying to help impart to one another (and always will all of our days) is to make sure they know what they could have as a relationship with the Father, Son and the Holy Ghost. Plead and beg and implore and beseech everyone to put aside the things that so easily beset. As Peter said, “I know you fall into these sins easily, but please put the junk aside! This is ruining your ability to fellowship with God and, in case you haven’t noticed, sin is not fulfilling in the long run anyway” (Rom. 6:21). In so doing, we are pointing them towards God in everything that we say and do; not in a goopie way but in a realistic and relational way. Then it becomes a matter of whether or not they are willing to pursue Jesus, the person, instead of their flesh and pleasure seeking. We are calling others to “turn to the Lord,” so that the veil of their disconnectedness with God falls away. As we’ve seen in our brother Paul’s teaching in 2 Corinthians 3, if we behold Him, then we are transformed from one degree of glory to another degree of Glory by the Lord Who is the Spirit. Just prior to that, you’ll remember, “if anyone turns to the Lord, the veil falls away.” We are calling others to “turn to the Lord,” so that the veil of their disconnectedness with God falls away. Attempting to face the Father on any other terms than through a Revelation of His Son is rejected before Him. By revelation in the inner man, we can actually “behold” Him. The Spirit of the Lord brings liberty to our lives and we are “transformed from one degree of glory to another.” The process is then to help others to turn away from the veil of blindness to behold Him. Help them to know that they can turn to the person of Jesus in their circumstances. That’s our role in life, that’s what we exist for—to help that process along in any way that we can. This is in stark contrast to religion, which just does good things or doesn’t do bad things. The Tree of Knowledge (the Tree of Externals), whether good or bad, still leads to death. Let’s draw one another to the Tree of LIFE. I’m no longer disconnected, off in some other world someplace, and then remember to pray. My “center of gravity” is in Heaven and I am a pilgrim, alien, and stranger here. I don’t even “speak the language” of the natives of this planet whose “father is the devil” (if they are not truly born a second time). Yet, with our Father, it’s almost the opposite of “forgetting” to commune with Him. Instead, you catch yourself saying, “See you later” instead of “amen,” because there’s such a reality that you forget to be religious for a minute. You’re so conscious of Him that it’s just a relationship like it would be with another person. Not in a buddy-buddy way; I don’t mean that. It’s with great reverence and awe, with a consciousness of God as with a friend who puts His hand on our shoulder and says, “Arise, I’m with you, I’m for you, let’s do it together.” That kind of thing wouldn’t have our jaw dropping all the time in gooshy-ness, but it sure would affect how we live and how we think, what we look at, what we talk about, and choices that we make. Life is not disconnected events and circumstances, but everything is a clue in the Spirit about where we go next with our life, and how to relate (or not relate) to a person, and how to best encourage them in Christ. Oh, how that would effect the way in which we would hold even the most slight and trivial conversation! An awareness or consciousness of God, a revelation of Jesus, even in a trivial conversation with a person, would somehow manifest itself in a sensitivity others could not have. You would “hear” the person’s attitude, you would consider who they are in the Spirit, and see God’s face in regard to the conversation. For one walking in Revelation that flesh and blood has not revealed, every little thing that happens, every conversation, is a clue about spiritual life and the tasks that are in front of us, for Him. Life is not disconnected events and circumstances, but everything is a clue in the Spirit about where we go next with our life, and how to relate (or not relate) to a person, and how to best encourage them in Christ. The most trivial things are all clues because we’re conscious of God. There’s a revelation of Him that makes all these things just part of the one larger picture, rather than the “shell game” of which shell God is under. Most folks, frankly, live that way because they will not “lay siege” to the Father of Lights for Revelation, and Christ is therefore not yet “formed in them” (Gal. 4:19). In addition, a Revelation will result, as we sense His love and His Holiness, in a consecration and obedience to Him that has no hint of legalism in our hearts. We just love Him. It’s what WE want for Him. We don’t need to have, as participants in the New Covenant of God, our neighbor constantly saying to us “Know the Lord! Know the Lord!” Why do we not need, if in Revelation, someone twisting our arm to obey Jesus? Because we “all know Him, from the least to the greatest.” If we are feeling like we are hemmed in by others’ expectations of us, and feel pressured by what we should and shouldn’t do, we are very likely not seeing Jesus by Revelation of the Father. If we find ourselves often not “getting it” when others speak to us of the Ways of God—or we are perpetually “on the outside looking in”—or in need of correction or lacking in Wisdom in situation after situation—we are in dire need of a Revelation of Christ. The Gates of Hell do NOT prevail when we have a true Revelation, and our lives are built on this Rock of knowing the Son in the inner man. Generally one can tell a person that is walking in revelation (versus one that is honestly desiring it but not walking in it) by their discernment. There is a distinct lack of discernment amongst even good-hearted folks that are living on the earthly plane, rather than “seated with Christ in heavenly realms,” “seeing no man after the flesh.” They’ll perhaps readily embrace someone, say a visitor from another city or another country, or a radio teacher or author that says some good things. He’ll be a hero and whisk them off of their feet, though we know nothing about his life. There’s just a naivete that comes with a lack of revelation of Christ, where one would believe and embrace things on a superficial level. “Blown here and there by every wind,” Paul would say, apart from the “intimacy/full knowledge of the Son of God” (Eph. 4:11-16). Or they are critical of everything on a superficial level. It could be either one, depending on whether they are optimistic or pessimistic. But the fact is, a person that has really seen God and is walking with God is going to be a discerning person. God means for the new covenant to be lived in His Spirit...that person will discern, and “know,” and be able to guard their heart, as well as help others. “Did not our hearts burn within us as we walked along the way?” The two on the road to Emmaus knew who this Man was, though they did not recognize Him with their physical eyes. There was an inner test. John referred to it in 1 John 2 (written 60 years after Pentecost to average Christians), where he said, there is “an anointing on you that is real and not counterfeit.” “I don’t need to tell you how to evaluate a man as to whether or not He is walking with the True God (the context). The anointing on you will teach you these things. If you’ll listen, if you’ll watch, if you’ll seek God in it, then He will show you what’s really there.” A person that is not walking in a revelation of Christ could embrace about anything on a superficial plane. In addition, if you were to discuss something that requires spiritual discernment with a person without Revelation (no matter how spiritual they may seem externally) “it is foolishness to them,” Paul said. Or “legalism.” An example. Possibly they are involved in a friendship that they, perhaps, should not be giving their heart to. They are giving away their affections to, and “bonding” with, fellowshipping a child of the devil, an unbeliever. If you were to bring this kind of thing up with them, the record shows that they don’t “get it.” In fact, they may very well accuse you for touching their life. This is some of the tension that comes up when we live in the old covenant life, where a man must continually say to his neighbor, “Know the Lord! Know the Lord!” If we attempt to build with good intentions, belief systems, or any sort of externals, we are violating God’s Heart and opening the door for large problems. This is one reason why ONLY those with Revelation that is directly from Heaven itself may be considered part of the assembly of Believers. We may not extend total, open relationship to those that have not met God in the inner man. We may only extend the same level of relationship to them that they currently experience with Jesus. We are, after all, *His Body*, not a religious organization that holds meetings to commemorate Him and propagate His teachings once or twice a week. If I’ve seen Christ, I also have a sense of the counterfeit of Christ in a very clear way. God means for the new covenant to be lived in His Spirit. A person that is walking in a revelation, a consciousness of God, a sobriety, a fullness before God—that person will discern, and “know,” and be able to guard their heart, as well as help others. “Jesus would not entrust himself to them, for he knew all men.” One with Christ reigning in their inner man will not easily give away their heart because they are totally aware of Satan’s devices, and they have an ability to “smell” him and his dealings. A recent movie called “Abraham” depicts an encounter between Melchizedek and Abraham, when those two came face to face. The movie didn’t really do it justice entirely, because it underplayed the significance of who Melchizedek is. But still there was something about it. Abraham would start a sentence and Melchizedek would finish it. “I know the Lord and I...” and Melchizedek would say, “...worship Him.” This happened again and again. Abraham had, for good reason, a big grin on his face. Sarah said “You found somebody who understands you!” which was an understatement of immense proportions. As they finished each other’s sentences, there was an acknowledgement of mutual revelation of the Godhead that did not have to be, and could not have been taught! There was an anointing that was real and not counterfeit. And in fact the very proof of that mutual anointing was the fact that they could finish each other’s sentences. That was the demonstration of it. A test of authenticity in a way. “And you...” “...worship Him.” What is this word “worship”? I mean who used that word? They could identify with that word because they had both encountered the same God. And you serve Him, and you obey Him and you sacrifice animals to Him? NO. You worship Him. How did you know that word, Melchizedek? You can only know that word if you’ve encountered the same God. That kind of “surprise” is often a test of authenticity, to give our hearts away (though sensing the “Spirit” of a man beyond the words is even more important). The true church is built on our ability to entrust our hearts to those who can finish our sentences. That’s the way the church is built. It’s built on nothing less than that testimony of Revelation that absolutely COULDN’T have been counterfeited or parroted by men. The true church is built on our ability to entrust our hearts to those who can finish our sentences. “And you...” “...worship Him.” That’s it. If it’s not built on that, it’s not the church. It’s just a styrofoam counterfeit based on ideas and traditions of men and religious deeds and programs and speeches. The gates of hell will prevail if it’s built on anything less than the ability (just to use that idea for one more moment), to finish each other’s sentences. We’ve encountered the same undefinable, undescribable God, that flesh and blood did not reveal. We didn’t just borrow from a Charles Stanley or Bill Gothard or Kenneth Copeland sermon, or a Billy Graham newspaper column. We’ve found HIM. We relate to Him as to a friend. We have no claim to anything simply because we know everything about Him, or because we’ve obeyed everything He’s ever said. Revelation of a Living God is what life is all about! Abraham suffered failure and God still counted him as our “father” because of something he *had*. Success in every area of his life wasn’t his claim, but there was something he *did* have that God counted as the most valuable thing. There was something David *had*. Success in every area in his life was not something he could boast of. But there was something he did have that made Jesus “the Son of David.” The Son of God was also the Son of David. Something David *did* have made him “A man after God’s own heart.” It’s that “something” I’m trying to lift up to you as the Rosetta stone—the translation key of all christian life. That’s what I’m trying desperately to lift up to you as the non-negotiable necessity for any ability to give away your heart and to walk together and to build together in a church or “fellowship.” That’s the non-negotiable, indescribable thing that I’m trying to describe to you, which is the ability to finish each other’s sentences. Something that is based on an encounter with God, and not far away words (see Jeremiah 23). God rejects all but true revelatory Life: that alone is substantial and real and worthy in His sight. A true Revelation will have a sense of awe about it: His fullness, His Promises, His Reign, His Return. A true Revelation will have a sense of awe about it: His fullness, His Promises, His Reign, His Return. We will “discern the Body,” the Life of Jesus in His church, when we have true Revelation of Him. We cannot any longer say “we have no need of you,” or live in such a way as to not be mutually dependent and sacrificial for the Bride Jesus is preparing to bring to Himself. DAILY!!! One cannot truly have the Head without the Body. 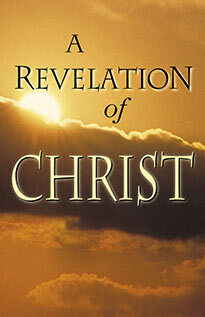 Look for this devotion to the Life of Christ in His Body, on a daily basis, if one is truly in Revelation. Jesus feels the same way He always has: “Zeal for the Father’s HOUSE *consumes* me!” Those saturated in Him will feel what He feels. True revelation from the Father of Jesus will manifest itself in some amazing ways. Now I am not trying to put this out of reach for you; on the contrary, I am trying to get you to reach for the only thing that is real, and to not be satisfied with anything less than that. Don’t try to build on anything less than that which is born “of GOD!”—based not on human decision, or a husband’s will, or natural descent. Anything that is built on good intent, but not truly described as that which flesh and blood could not have revealed . . . will crumble. The gates of hell will prevail. Don’t build on sand. Revelation of Christ...Just continually beg Him for Insight into how to build that way, and how to have the courage to not accept anything less than that. Do consider all of this? Please don’t lower Jesus’ standard and attempt to build with something less than Jesus? Revelation of Christ is the only common denominator: no carnal sympathies. It can’t be anything other than a revelation the Father Himself has given. One can use the best masons, plumbers, electricians, carpenters, and laborers on the work-site, but if the foundation is sand, it doesn’t matter what kind of workmanship goes into it—it will collapse. Only you can really make that decision that anything less than a revelation of Christ is unacceptable in your life and the lives around you, or the church you are a part of. No one must consider themselves a part of the group of Believers you are a part of, if there is not a supernatural Life springing forth from them that the Father has granted to a humble, desperately hungry heart. I’m not recommending any kind of judgmental scrutiny, but I’m just saying the church is built only upon inner knowing, and embracing those things that are Jesus while holding at arm’s length those things that are but religion or good intentions. Just make sure that it’s your commitment before God (not always knowing how to act on it, not always knowing what it is, but at least it’s a commitment before God) that this is the only way you’ll want the House to be built. Just continually beg Him for Insight into how to build that way, and how to have the courage to not accept anything less than that. The Stuff "ANGELS long to look into!"